When we were filmed recently for Channel 4 News we were delighted to discover the very talented producer was a fellow working mum! 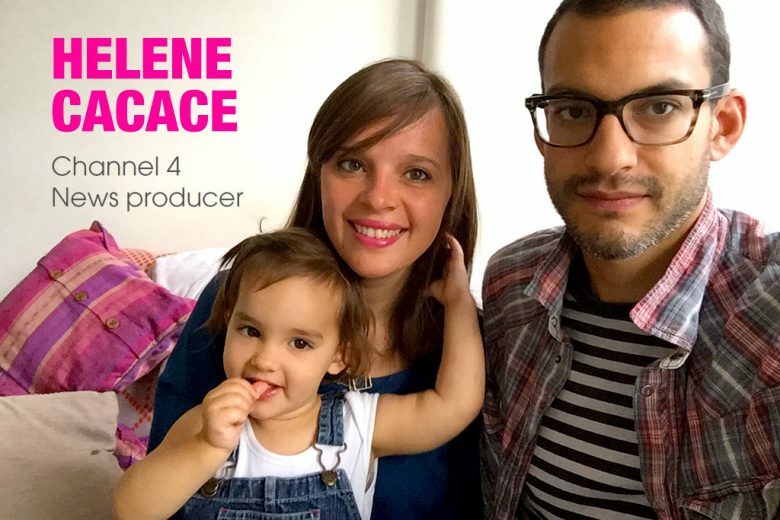 So we asked Helene Cacace to tell us how she juggles her career with her family. I’m a producer on Channel 4 News, mainly on the Arts desk. On a daily basis, what does your job look like? It’s a cliché but every day is completely different. We attend an editorial meeting at 9:30am and that’s usually when it’s decided what everybody will be doing. As a producer I will be allocated a specific story and research it, find the best people to interview, work out the most relevant location to film in and decide with the cameraman, reporter and picture editor how we want the story to look. I’m also responsible for making sure we have a report that is ready to go to air at 7pm. I usually go filming with the reporter and cameraman, but today I’m doing something totally different – I’m the programme’s Chief Sub-words which means I write and edit what the presenters will say. I work long shifts (usually 9:30am until 8pm) but that means I work four days a week. How did the way you work change once you became a mum? It’s more difficult for me to travel now. At one time I would jump on a plane at any given opportunity, but that’s obviously had to change. I mainly cover arts stories at the moment and they’re usually based in the UK. Saying that, since I have come back to work after maternity leave last October I have travelled a little – I was in Greece for the elections, went to Brussels for an EU summit and went to Spain with Jon Snow to film a flamenco guitarist! Travel takes more planning with my husband. I spend the mornings with my daughter before work and take her to nursery, so we have to work out who will do that when I’m away. Work have been really understanding about the fact I can’t go away at the drop of a hat any more. What difficulties are there in continuing your career now you’re a mum? I work on Channel 4 news which is on for an hour at 7pm – there’s no option to finish early as the news doesn’t stop at 5pm! We wanted to send our daughter Polly to nursery during the day but that finishes at 6pm so we had to work out who would look after her in the evenings. I also didn’t want to pay for five days of nursery when my long hours mean I work a four day week. How have you found a way around it? My husband had to ask his employers to finish work an hour early at 5pm so that he can pick up our daughter from nursery. My employer agreed that unless I’m urgently needed in the office, my day off in the week is a Wednesday. How did you come to agree that solution as a family, and has there been any impact on your husband’s career from leaving early? We knew there was no option for me to finish early and luckily my husband’s employers have been very understanding. For some jobs he is paid a slightly lower day rate because of this. However, he spends one-on-one time with our daughter four evenings a week giving her her dinner, bath and putting her to bed. Knowing that they are having fun together makes it easier for me to be at work. They send me a picture every evening of their antics. I love meeting new people from completely different walks of life and hearing their stories. I love making films and working out how best to do a story justice. I love being in a newsroom working with brilliant people, covering the important issues of our times. And what would you change, in an ideal world? In an ideal world I would have more holidays (who wouldn’t?!). Actually our company has just introduced a system where you can buy five extra days holiday (pro-rata). What’s been your favourite news story you’ve covered? It’s really hard to say and favourite is probably the wrong word but I found covering the Japanese earthquake extremely moving. We arrived not knowing what we were going to see and those scenes of absolute destruction – whole towns completely torn and washed up – will never leave me. On the Arts desk I’ve loved meeting the artist David Hockney and being one of the few people to see Lucian Freud’s studio before the door was shut forever. I was also the producer and in the room during that infamous clash between Quentin Tarrantino and Krishnan Guru-Murthy when he was probed about the link between violence on screen and real life. What advice would you give other working mums? I think the most difficult thing to deal with is the exhaustion when you first go back to work. Juggling everything, especially with a baby who wakes up in the night, is really tiring but it’s true that it does get better as your child sleeps longer and you all get used to the routine. It can seem really difficult at first to put your child into childcare, but I know that my daughter has benefitted immensely and learnt a lot from spending time with other children and being in a nursery setting (and possibly from being away from me!). I love my job and can’t imagine giving that up and being a stay at home mum. I have also always paid my way and would not want to be completely dependent on my husband’s salary. I also think that because I work, the time I do spend with my daughter is really focused on having fun together. Online supermarket shopping has saved our Saturday mornings!